This past holiday season, online retail spending in the U.S. reached a record $37.5 billion, up 15 percent from a year ago, according to comScore. For many online retailers, this significant growth led to record-breaking sales for their businesses, and along with it, a higher-than-expected number of orders that had to be fulfilled. Now that the holidays are over and things have started to settle down, many eCommerce sellers may be reevaluating their current fulfillment operations. For those that handle fulfillment in house, you may be asking yourself if outsourcing is the right move in order to save your business time and money. For some that outsource, you may be thinking the opposite, wondering if your business would be better off handling order fulfillment on your own. You may also be thinking that, rather than an all or nothing approach, perhaps partial outsourcing makes the most sense for your business. When it comes to eFulfillment, there is no “one size fits all” model. What makes sense for one business, may hinder another. But luckily, as an online seller, you have choices, and below we’ll take a look at three different approaches to eCommerce order fulfillment to help you weigh in on the pros and cons of each. There are a number of reasons why outsourcing fulfillment might not be right for your business. You have to depend on your fulfillment center’s delivery reliability and speed. 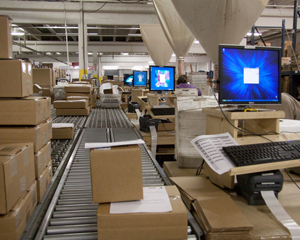 Your fulfillment provider may make more mistakes than you or your staff would. The return processing workers may not be able to judge the scalability of your returns. The outsourced cost may end up more than you would pay doing fulfillment on your own. Another key reason mentioned was that merchants may have to rely on generic systems when using an outsourced fulfillment partner, rather than creating a unique fulfillment process that suits their businesses. For some online sellers, they may find that fulfillment centers are either unwilling or unable to cater to their unique needs, in which case outsourcing their order fulfillment becomes more challenging, or not viable at all. Outsourcing can absorb seasonal spikes in shipping and returns volume. Most fulfillment houses provide access to FedEx and UPS discounts. All established fulfillment providers guarantee their work. Outsourcing converts fixed costs like rent and labor to pure variable cost per order. You can focus on what you do best by outsourcing unfamiliar tasks. For many new and established online sellers, outsourcing fulfillment makes the most sense for their businesses. With the right partner, they are able to take advantage of shipping discounts, technology and experience, while maintaining complete visibility into their operations. For many online sellers, outsourcing all of their order fulfillment is the right way to go; for others, they find that outsourcing a portion of their fulfillment is the most fitting solution. We’ve listed some of the pros and cons of in-house and outsourced fulfillment, and discussed why there is no one size fits all approach to getting your products in the hands of your customers. In some cases, online sellers find that outsourcing a portion of their fulfillment operations makes the most sense, perhaps for reasons due to geography. For example, an online merchant based in the UK may fulfill orders in house for all products shipped to its customers in the UK. For orders shipped to customers in the U.S., that merchant is able to save money and significantly shorten delivery times by using a U.S.-based fulfillment house. Many distributors that have historically focused on business-to-business (B2B) fulfillment are now offering business-to-consumer (B2C) fulfillment services for eCommerce orders. While the demands of eCommerce B2C fulfillment can differ greatly from B2B fulfillment, as is discussed by Derek Singleton from Software Advice in this post, if those demands are met, online merchants may elect to have their distributors fill a portion of their eCommerce orders. There are many factors to consider when choosing the fulfillment model that is right for your business, and while cost is certainly not the only consideration, as Mr. Lindberg explains, it is important to fully analyze the cost you pay now per order fulfilled, versus the cost you would pay with an alternative solution.